The only time most people enjoy feeling afraid is in a scary movie or on a roller coaster. There are moments when we actually feel more alive and excited and truly connected to our physical selves because we have allowed a manageable amount of fear in our lives. And then, there are those fearful feelings we avoid at all costs. This kind of fear is often called a phobia. It arises when we build a habit of avoiding the things that trigger our fear. Dr. Stanley Rachman wrote extensively about this- fear and courage are enemies that struggle within us. When we meet fear with courage, it grows smaller. When, instead, we meet fear with a desire to protect ourselves, we give the fear legitimacy, essentially telling the brain that it is right to raise the alarm, because we agree that this thing is actually a risk. Let me give you an example. Suppose a child is given a balloon to play with. The balloon pops, and the child gets a bad surprise. The next time she encounters a balloon, she can either say “These things sometimes pop, but it doesn’t do any lasting harm, and I had fun with it until it popped, so I’m going to go ahead and play with it”, or else she can refuse to have anything to do with these potentially noisy objects. And then her parents might get into the situation and say, “Don’t give her a balloon, she’s afraid of them,” which reinforces the child’s nervousness about the balloon and prevents her from having an experience of courage that is sure to work out well for her (because she can never again be surprised by the fact that balloons pop). So, the next time there is a chance to take a balloon, the child has several problems: she has had a bad experience, and she doesn’t want to be inconsistent and enjoy what she said she was afraid of, and besides, her parents are expecting her to be afraid. So she follows the script and turns away from the balloon again, further reinforcing the fear. 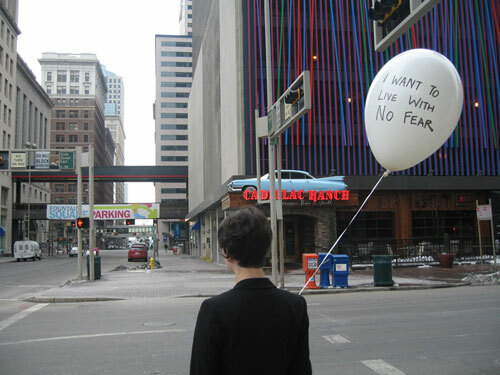 It may sound silly for a person to be afraid of balloons, but it’s a reasonably common phobia. And it shows how these things develop. The threat monitoring system in the amygdala takes information like this, and stores it as it’s orders for how to operate. So when something on it’s watch list- like a balloon, or a snake, or a stranger, or a cliff is detected, it pours adrenalin into the system to prepare for response to the “danger”. Whether the risk is serious or not, we only have one kind of response, the Fight/Flight/Freeze reaction, and it makes us feel like something serious is going wrong. So what can we do with this information? Well, it’s a bit of a long story, to be addressed in future posts, but I’ll give you a spoiler now. The answer seems to lie in exposure to the thing we fear. Careful, slow, persistent efforts to get ever closer to that balloon over a period of time will build our sense of safety and our courage. I’m going to write more about this, and I’d love to have your questions to work with. What do you want to learn about controlling fear?